Russian Festival Matryoshka takes place annually at park Canada's Wonderland. 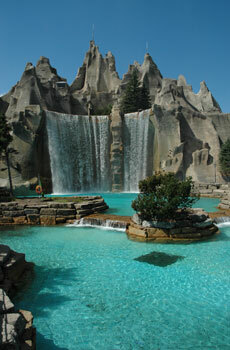 Canada's Wonderland is Canada's premier theme park that features over 200 attractions, more than 65 thrill rides and North America's greastest variety of roller costers and Splash Works, a 20 acre water park. All this, plus a full day of Russian entertainment and contests is included in the admission price! Find out where to buy tickets. By Public Transit, the park is accessible view the Wonderland Express "GO" Buses run regularly from Yorkdale and York Mills subway stations. Visit the TTC website for details. t's showtime every day at Canada's Wonderland! With two award-winning shows, the return of a Nickelodeon superstar, dazzling dives and gymnastics shows and characters galore - Canada's Wonderland is the place for fabulous live entertainment! Copyright © 2003 - 2019 Matryoshka LTD.